until the British were in close range. "Don't fire until you see the whites of their eyes!" 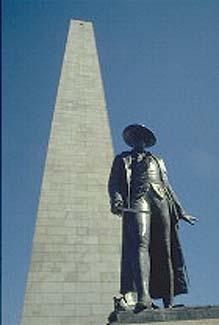 This famous order, which legend attributes to Colonel William Prescott, has come to symbolize the determination of the ill-equipped colonists facing the powerful British Army during this famous battle fought on June 17, 1775. 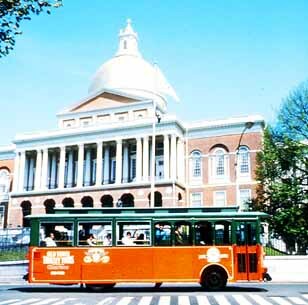 The battle is popularly known as "The Battle of Bunker Hill" although most of the fighting actually took place on Breed's Hill, the site of the existing monument and exhibit lodge. of Boston was control of the hills on the Charlestown peninsula. This position overlooked both Boston and her harbor. On June 15 the Americans learned that the British planned to occupy Charlestown. To frustrate them the Americans decided to act first. Both armies had fought courageously and learned much. For the Redcoats, the lesson was painful. Although they had captured the hill, out of 2,200 soldiers engaged, 1,034 were casualties. 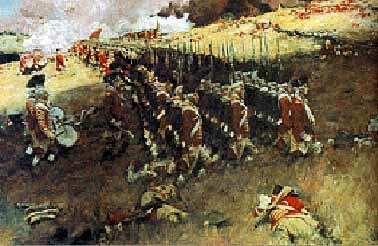 The Americans had shown they could stand up to the British in traditional open field combat. But where they had succeeded, it had been through individual gallantry rather than tactical planning or discipline. 600 American soldiers were counted as casualties. a statue of Dr. Warren. Hours: Visitor lodge and exhibits open daily, 9:00 a.m. - 5:00 p.m., except on Thanksgiving, Christmas and New Year's Day. The monument is open to climb from 9:00 a.m. to 4:30 p.m. daily. For more information please call (617) 242-5641.